Short videos and animated gifs are in vogue in Twitter, as we can fully watch them in our fragmented time. However, the official Twitter app does not have a video download option. If you have ever encountered this problem, check out this guide below to quickly download Twitter videos and gifs on your Mac & Windows computer and iPhone & Android mobile devices. These methods are guaranteed to work well, and we’ll keep our eyes on this list every now and then to make sure they are still reliable. Now let’s talk about them one by one. Whenever you find a funny and interesting video or gif, you can download and install a third-party Twitter video downloader to save it to your devices. 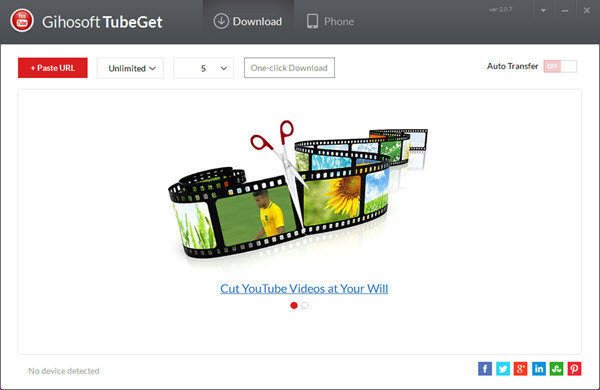 For Windows or Mac users, you can try Gihosoft TubeGet, a video downloader intended for you to save videos from YouTube, and Twitter of course. Apart from Twitter, it also gives you the opportunity to download Facebook videos. For saving Facebook videos, you can refer to this article: Download & Save Facebook Video. Now let’s back to the topic and see the step-by-step process of how to save Twitter videos on Windows & Mac with Gihosoft TubeGet. Copy the link of your favorite Tweet video or gif. Just click the menu down arrow on the upper-right corner and select “Copy link to Tweet”. Then you’ll see a pop-up window that you can copy the Tweet link. Or you can click the time above the tweet and a new interface will pop up, copy the URL from the address line. Open Gihosoft TubeGet and Click “+Paste URL”. After it finishes analyzing, just choose the right video format, resolution and the saving place. Press “Download”. It may take you some time to finish the downloading process. 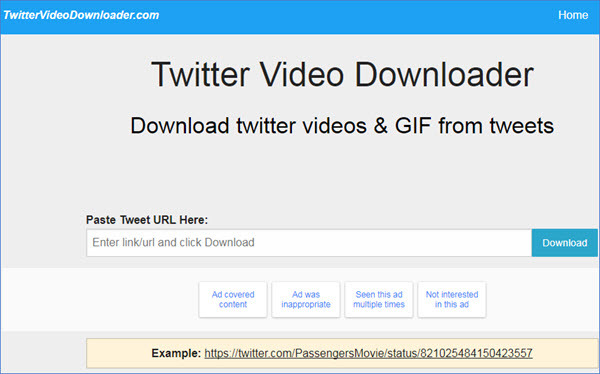 Twitter Video Downloader is a completely free online Twitter video downloader site. With it, users can be self-sufficient to download short videos & Gifs from tweets to their Android, iPhone, iPad, Windows & Mac devices without installing any other desktop software. With this online site in hand, you can play all your downloaded Twitter videos offline even if you are out of range of cellular connections or WiFi hotspots. So if you’re still searching for a best Twitter video downloader, you’ll love this site. Now let’s dive into the site and see how to keep videos from Twitter with it. Copy the tweet URL as described in method 1. Paste the tweet URL in the box, then the Twitter video downloader online site will interpret the link. Shortly after the Twitter video URL is identified and loaded, the site will skip to the download page. To save this short Tweet video to your device, first you need to pick the preferred video resolution. 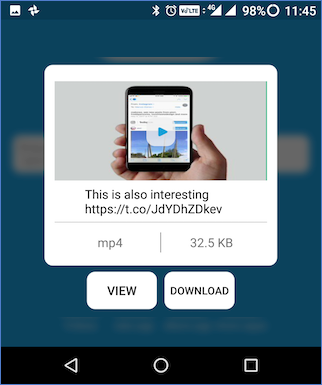 Then you just click on “Download Video” button, rename the short video and click “Save” button, then the short video will be downloaded as MP4 format on your target device. From funny videos to makeup tutorials, prank videos to MV, there are so many videos on Twitter worth watching. Watching videos on Twitter is not a difficult thing if you have a decent Internet connection, but is not that easy to save Twitter videos to devices for offline playing when you are on the go. 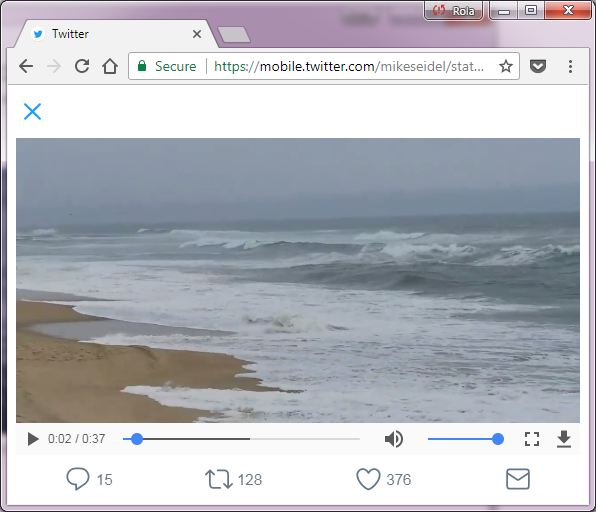 Luckily, aside from those 2 methods above-mentioned, there are also a handful of great extensions and plugins existing to make your Twitter video offline watching experience quite smooth. Today I single out a very practical plugin – Twitter Media Downloader, an extension for Chrome and Firefox, which can definitely satiate your need. The biggest advantage of this plugin is that it has the ability to batch download all the videos, gifs and images on the Twitter. Then how to download all the videos on Twitter at once using this plugin? Let’s see the downloading process on Chrome browser. Step 1. Search “Twitter Media Downloader”on the Chrome Web Store, hit ”ADD TO CHROME” button to install this extension on your Chrome. Step 2. Find the video you want to download on Twitter. Then go to the video owner’s Twitter account homepage, you will find a download arrow displayed next to the “Media” column. Step 3. Specify the Tweet ID range. What’s Tweet ID? It’s the numerical part of the Tweet’s URL. For example, if a Tweet URL is https://twitter.com/CNN/status/983181182530719745, then 983181182530719745 is the Tweet ID. Choose the number of Tweets you want to download, and copy the upper limit and lower limit of the Tweet ID. Step 4. Click the download arrow next to the “Media”column, a new dialog will pop up. Just input the Tweet ID range you want to download, and choose what kind of media file you want to download. Step 5. Click the “Start”button, the extension will now analyze the media file. After analysis, a ZIP file containing the target image, video & gif files will be downloaded to your computer at a time in bulk . Installing a third-party software to download Twitter videos or gifs is a generic method. But why taking up extra computer space as you can finish this task directly through web without any software in just a few steps. Here I’m going to share you a fantastic trick that will let you download any video or gif from Twitter without using any software or online tool, all you need is your Chrome browser. This trick might be a little difficult for a computer novice the first time, but once you have a handle on that, you will uncover a new world of online video downloading. Copy the tweet link as described in method 1. Open a new tab on your browser, and paste the URL in the address line. Add “m.” or “mobile.” behind “https://”, press “Enter” and this will redirect it to the mobile version of Twitter. Play the video on the new interface, then right click on the video and select “Save video as” option. Rename the file and choose a saving location, then click “Save”. The video or animated gifs will be saved in MP4 format. By now you will probably know the way to save Twitter videos directly with Chrome. For many of us, it’s a great fun to shoot videos and post them on Twitter to share with the world and receive likes from our fans. Vice versa, it’s also a joy to watch short videos published by people we have been following. We follow them because they create a lot of things that let us learn or laugh, and sometimes you may even want to save these video contents on your Android & iPhone Smartphones for offline viewing. Although Twitter doesn’t give any direct option to download videos or animated images, but we can appeal to other third-party apps. Next, I’ll show you the best workarounds to save videos from Twitter on your iPhone & Android phones. Download Video Downloader for Twitter from the web, then install it on your Android phone. Launch the Twitter app and find the video or Gif image you want to download, open the media and it will take up the entire screen. From the bottom of the screen, tap on the “Share” You’ll be given a list of options where you want to share this media file. Select “Video Downloader for Twitter”as your target. On the new interface, select the video format & quality you like, click on “Download”button, then the Twitter media content will be saved on your internal storage or SD card. Tips: If you want to download Twitter videos or gifs on your iPhone or iPad devices, you can try Video Downloader for Twitter IOS version, and the usage is similar to Android version. The Internet always wants to make us believe that it can keep all the things that users post. However, there’s no guarantee that your favorite videos on Twitter will be alive forever, either they will be deleted or be hided by the posters. So it will be helpful to download those videos offline, either for keepsakes or for sharing them with your friends who aren’t on Twitter or don’t have an opportunity to watch them. You can do this quite easily, if you just have the right online Twitter video downloader, and TWSaver is one of the best apart from the ones mentioned above. As a website, this tool is available for Windows, Mac, Android, iPhone & Linux platforms. You can utilize it to save Twitter videos in UHD, HD, SD quality in MP4 format to your desktop and mobile phones. The site has no limit, so you can feel free to save any Twitter videos 24/7. To make your downloads more secure, TWSaver don’t keep track of the download histories, and don’t save a copy from downloaded Twitter videos. The usage of this site is quite simple, and below I will show you how to use it. How to Save Twitter Videos Online? Copy the tweet link like method 1. 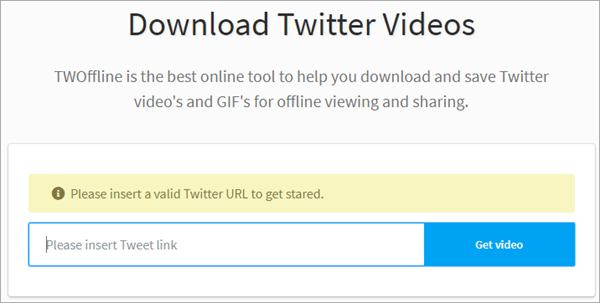 Enter the Twitter video URL you want to download into the box, then press the Download button. The site will automatically create 3 buttons with available video quality (UHD, HD & SD ). Choose your ideal quality, and right click on the Download button. Select “Save Link As” from the options to start the video downloading process. Millions of users have uploaded tens of millions of short videos to Twitter, making it one of the most popular video-sharing social media apps. With so much video content, there are a number of occasions where we’ve wanted to save a video directly to smartphones, whether it be to simply watch again at leisure time or to re-share it with friends on other platforms. But it’s not always as easy as just tapping and saving directly from within the app, if you are still looking for a way to save Twitter videos offline, Twoffline can help you. Twoffline is designed for users to save Twitter videos and GIFs for offline viewing and sharing. With a straightforward interface and self-explanatory layout, both novices and professionals can utilize all its features to download high quality videos and GIFs from Twitter in a few clicks. Copy & paste the link of the Twitter video you want to download. Enter the video link into the text box, and hit the “Get video” button next to it. Now you will see all the available resolutions for the video. Choose your favorite resolution, then click on the “Download video” link to start the download. Downloading videos and gifs from Twitter using any of these 7 methods in 2019 is a breeze as it requires only a few steps. So next time when you come across your favorite videos or gifs on Twitter, just download them and play it at anytime, anywhere as you like. If one of our recommendations isn’t working, let us know in the comment section below.